How do you know what your kids value most this very minute? Find out with this art and writing project that is perfect for Valentine's Day or any other milestone time in your child's life. This post was refreshed with new graphics on January 11, 2014. I am an Amazon affiliate, and the post contains affiliate links. For full disclosure, please click here. 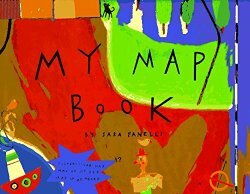 My Map Book by Sara Fanelli takes the concept of maps beyond geography. A young character of the book creates a neat visual map of his day, a color map, a more common map of his room, a map of his (or her?) family, a treasure map, and some other maps. I am always impressed by adults that can imitate kids in their artwork – this book looks as if it was illustrated by a child. 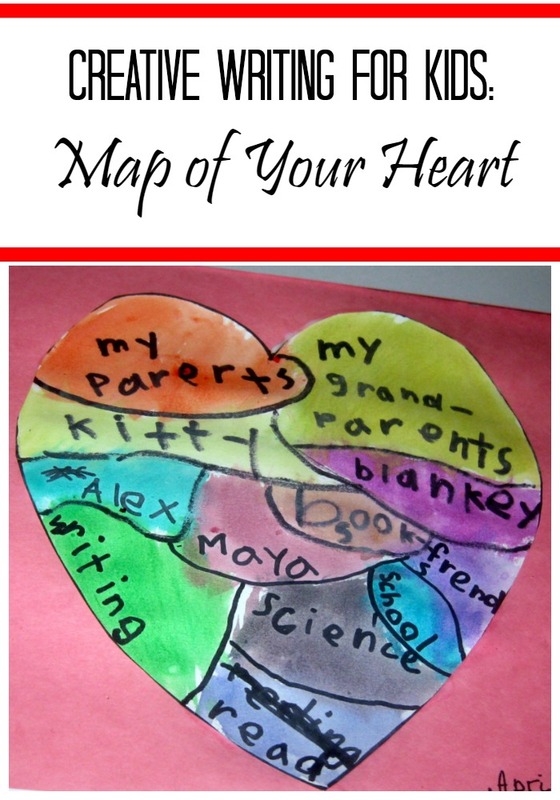 We read this book together, and came up with an idea to combine writing and art and create our own “Map of Your Heart”. I drew a big map on a watercolor paper with a sharpie, and Smarty broke it into “regions”. She chose to write her favorite things, not to draw them, it’s pretty typical for her now. I wanted to do the whole project in her own spelling, but she insisted for me to tell her how to spell science. Then (on a different day), she filled her sections with watercolors. It’s sweet that in this kindergarten year we are still number one on her map with her favorite objects close by. It’s also good to see that friends take space in her heart – she definitely grew a lot socially this year. The only real surprise was to see “writing” on the map – in kindergarten my reluctant writer developed into an enthusiastic storyteller and especially into a scientist who makes notes about things that she observes. What would be on your children’s heart maps? If you do this project, share a link in comments! Follow my Writing Pinterest board. What a sweet project! Anna's writing skills are amazing. I love this idea! Wonder if Emma would enjoy this? I remember seeing that project when I read the book and thinking it sounded fun! This sounds like a fun project. I'm glad she had a great experience in kindergarten! JDaniel would have put robots and being outside on his heart! I love this project, Natalie. It is so sweet and really encourages some deep thinking. I am pinning this and sure hope to tie it in with one of our FIAR selections for Joe soon. I LOVE it! Anna's heart is very full! What a sweet sweet SWEET idea! I love it. Very special. Pinned! Beautiful art ad a great project! I love this idea! Definitely trying this with my son.